Firtstable, I’m not English and my English is not good, ’cause I forgot a lot of words not speaking it every day. But I’m trying to translate my recipes in order to allow foreigner people to cook Italian dishes! It’s a little bit hard to convert from grams to American measures, because in USA they use “cups” and 1 cup of milk is 240ml but 1 cup of butter is different, because its weight is not the same as milk! Anyway, I’m trying so, American people, if you are reading my recipes and there are mistakes, please tell me! 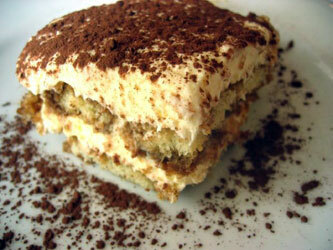 Tiramisu is a very famous Italian dessert, sometimes my bf asks me to make it for him, and in 2 days he eats it all…. I don’t like this dessert….but for my bf mine is the best in the world!